This blog post is reposted from Medium. 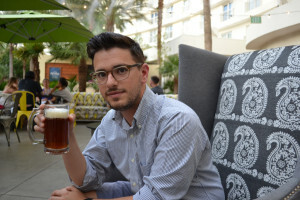 When I shut down my startup last year I thought to myself, “It would be nice to have a job where someone else told me what to do for a little while.” Unfortunately, that wasn’t the case when my next job ending up being a Product Manager at Yammer. Turns out, I joined a product-focused company that values autonomy, and took on a role that has little formal power but lots of responsibility. If that sounds a lot like being a startup founder, it’s probably also why founders so often end up as product managers. I was initially discouraged by my search for a role as a product manager. While I had job offers from a few early stage startups, I couldn’t get past a resume screen at most of the growth-stage tech companies I talked to. I don’t have a computer science degree and my career doesn’t fit in any one box: I was a progressive nonprofit campaigner, an online marketing consultant, have an MBA and a Master’s in sustainability, and had founded a company in the HR space. But the truth is, I’m a tech and product geek. I’ve been building websites for over ten years, know my way around front-end code and web architecture, have worked with plenty of engineers and designers, and followed the lean startup methodology for validated learning in my company (while learning Ruby/Rails). Thankfully, Yammer’s application process focused on my product abilities, not my pedigree (Cindy Alvarez, our Director of UX, explains in “Why I Don’t Read Your Resume”). Instead of focusing on my resume, I had to complete a homework assignment that looked at my product sense, including my reasoning abilities, understanding of metrics, visual communication, trade-offs/prioritization, and feature ideas. Now, as I focus on recruiting for our team, I think this is a much better predictor of success than a resume (of course, I’m biased… even though as an MBA I spent plenty of time trying to craft the perfect resume). I now have the resources to build a great product and execute on the vision I have for a feature I’m working on. As an early-stage founder (and one that never found a technical cofounder), I was extremely limited in what I could build. I worked with a local development shop to build my MVP, but I didn’t have the team or the money to iterate fast enough when we received user feedback. That’s not to say I have unlimited resources at Yammer — not every project gets prioritized and we still believe in the value of small MVPs to validate our feature hypotheses (that means I need to cut as much as I build, or be a product editor as Jack Dorsey puts it). But now I have a team of amazingly talented designers, developers, and fellow PMs that are there to help me build a great product. There is also much less ambiguity about whether I’m shipping the right thing, as we have a large enough user base to A/B test our features, and an analytics team to keep me honest. Being part of a team of talented product managers at Yammer also means that I now have a built in peer group. “It’s lonely at the top” as they say, so as a founder I had to actively seek out peers and mentors by joining groups like Founders Network. Even then, I was still the only person that really knew about my business (it wasn’t until after I shut down that I was able to connect with peers from companies trying to address the same market). There is little more valuable than having peers to bounce ideas off of, to lean on for support, and to help to call you out when you do something stupid. My learning about product has been rapidly accelerated by being part of such a wickedly smart, strongly opinionated, open and honest team. Of course, there I things I miss from my time as an entrepreneur. While I have a lot of influence over what we build, my voice is only one of many that contributes to our vision. I also sometimes miss being “all hands on deck,” with everyone working on whatever needs to get done regardless of specialization. But I still do try to sneak a design mock or two into my product specs (which subsequently get torn apart by actual designers), and I recently wrote a few (bad) lines of code for a Yammer Hack Day project. But the reality is that every day I’m learning a ton about how to build great features, and getting to work on a product that millions of people use. After a two year hiatus since my last full blog post (about pizza of course), I’m finally back at it. I’ve officially moved my blog from GreenerNick.com to NickFassler.com (don’t worry, I’m still green), and I plan to blog here more regularly. As most of you know, my hiatus coincided with the launch of my startup Thrively (a web tool for radically simple employee feedback). I’ve since shut down the service but I’ve reposted a couple of my blog posts: a write-up on the culture of feedback at XPLANE, a Portland-based design firm; and the Thrively post-mortem about my experience launching and then closing Thrively. With the relaunch, I’ve also added a few features to my blog sidebar (☞): a blog-to-email signup form, a list of top posts (including my post on design thinking and storyboarding which has taken on a life of its own thanks to Google image search), and a better Twitter widget. Let me know what you think, your comments are always welcome! This post-mortem blog post is re-posted from the Thrive.ly company blog (which has since been shut down). It is with a sad heart that I announce today that Thrive.ly is shutting down. For almost two years, we have been dedicated to our vision of revolutionizing workplace feedback. Unfortunately, we have been unable to secure the financial resources necessary for us to continue. We are extremely grateful to have met and spoken to hundreds of you who share our vision, giving us your support and advising us on this journey. Most importantly, you gave us the motivation to get as far as we did. Even though Thrive.ly is shutting our doors, we’d like to think we have made a small dent in the world with your help. You have exchanged countless pieces of feedback with your colleagues, and have championed the cause of improving feedback in your organizations. Hopefully, some of your workplaces have more transparent feedback cultures because of our work together. The Thrive.ly web app will continue to be available for the next few weeks, and will officially shut down on June 15. Current users should access and save their feedback before that date (please contact us if you need any help). Why is Thrive.ly shutting down? In the wake of the dissolution of Thrive.ly, I’ve read my share of entrepreneur postmortems. Most of them analyze the mistakes they’ve made along the way and what they would have done differently. “Hindsight is 20/20″ as the saying goes, but I don’t actually believe that. As an entrepreneur, we work in uncertainty, and we make the best choices we can with the information we have at that time. There is no way for me to know what the outcome would have been if I had taken a slightly different path. Was I one meeting away from a seed investment? One call away from my first sale? Did I not recognize signs that we didn’t have product-market fit? I’ll never know, and I don’t think its worth my time to guess. The problem is, even some of the most successful startups looked like failures for a long time (known as the startup trough of sorrow). Here is what I know for sure: I put 100% into Thrive.ly and accomplished many of the things I set out to do that I had never done before (I launched a company, designed and built software, and raised money). That’s not to say I didn’t learn anything on the way. I learned a ton, and one of the most important things I learned is that it takes a long time to build a successful business (that “trough of sorrow” can last 2+ years). In fact, some folks in the “social performance management” space (aka the “lets tear down the awful institution of performance reviews” crowd) have posited that the market isn’t yet ready and it will take some time before someone can be successful. There is likely some truth to that. We were seeking out customers that embodied what we saw as the future: organizations that exemplify flat, democratic, and transparent cultures (inspired by the likes of WL Gore, Menlo Innovations, and many others). What we found here was: there aren’t actually that many organizations like this (although it is clearly a growing trend); and, the democratic organizations we met have such strong, unique cultures that they were hesitant to change processes or embrace a new tool. At the time we were discovering this, we watched a number of interesting competitors shut their doors (ClearGears, Worksimple, Qrew, UpMo, and Workity Work). While I was able to give myself enough financial runway to work full-time on Thrive.ly for a year (more truthfully, Emily was), we suffered the same fate because it ultimately wasn’t enough time to get to the next stage. Time isn’t just money, it’s also about motivation and drive. For most entrepreneurs, including myself, it’s easy to run out of those too without co-founders (even with co-founders). The next big thing I learned: recruiting a team is a larger challenge than I ever could have imagined. As a first time founder with only a tiny network in the startup world, I did everything I could to improve my chances of meeting great co-founders. I spent many months hitting up every Meetup, FounderDating event, and hack night I could find. I re-learned how to code and read everything I could about entrepreneurship and product development. I spoke about my vision at any venue I could find. And in the process, I had the chance to work on Thrive.ly with many amazing people: extremely talented web developers, visual and user experience designers, and fellow MBA’s. But unfortunately, I wasn’t able to find someone that had the right mix of talent, passion for the idea, and financial flexibility to make the entrepreneurial leap with me. There is also a double-bind that I’ve seen for myself and other first time entrepreneurs: in order to attract a co-founder, you need to prove you have the skill to build a great product; but once you do build something, it becomes harder to inspire someone else to feel ownership of the product vision. I have seen many first time co-founder success stories, but there is definitely some luck to it (or perhaps planned serendipity). Fortunately, I now have a great network of people to tap into when I’m ready for my next startup. What are the alternatives to Thrive.ly? Before you go off seeking other tools: I would love to find a way for Thrive.ly to live on. If you have any interest in repurposing our tool in some way, or would like to help us release Thrive.ly as an open source project, please reach out to me directly. As for alternatives, there are very few apps that I’ve seen that focus on Thrive.ly’s main competency of workplace peer feedback. Apparently, Rypple (now Salesforce’s Work.com) originally launched with a focus on feedback, but it is now part of a much bigger suite of tools including badges and peer recognition. 7Geese, which is similar to Rypple/Work.com, also features tools for direct peer feedback in its suite (as did WorkSimple which recently shut down). There are many other tools in the broader market of companies innovating on the standard performance review process. I think Small-Improvements is a company to watch, and was impressed when they were chosen as the vendor for Atlassian’s performance review innovation. Folks like GoodRevu and MicroEval are simplifying the standard performance review process; Teamly and WorkforceGrowth are social performance management tools built on the platforms Tibbr and Google Apps, respectively; 15five and TinyPulse are helping push employee feedback up to managers; and Kudos and Wooboard are making it easy to recognize employees. I’ve had the chance to talk to a number of my peer founders at these companies, and think they are all doing interesting and important work. I hope that, in the near future, we will see a few emerge that are really able to transform the dominant culture around performance management. Feel free to contact me with questions about this space, and leave a comment if there is an interesting company I missed or you’ve had good (or bad) experience with one of these tools. I’ll also make a quick plug for Lloyd Nimetz and Joaquin Roca who are both doing interesting consulting work with startups on agile performance management and company culture. I’m trying to figure that out now, but I’d like to apply my product development and online marketing skill set within a later-stage (read: funded) startup in SF. If you know someone who may be looking for their next product manager or “growth hacker”, please have them reach out to me on LinkedIn. Again, my sincerest appreciation goes out to everyone who has leant their support along the way: all of our users, advisors, investors, coaches, friends, and family (especially my wife, who has–among many other things–edited out my countless grammatical errors from this final blog entry). Thank you, and see you next time! This blog is cross-posted at the XPLANE xBlog, and re-posted from the Thrive.ly company blog (now closed). I had the great privilege of spending a day in Portland with the team at XPLANE to help with an internal session focused on feedback. You may not have heard their name before, but you’ve likely seen their work. XPLANE was making infographics way before it was cool, and their visual thinking diagrams (aka XPLANATiONS) have been used to demystify the trend towards media convergence, help numerous companies change their processes and culture, and my personal favorite, show people how to Get Things Done. XPLANE also popularized the use of “plus/delta” feedback, which has been deeply influential in how we’ve built Thrively (as our users well know). 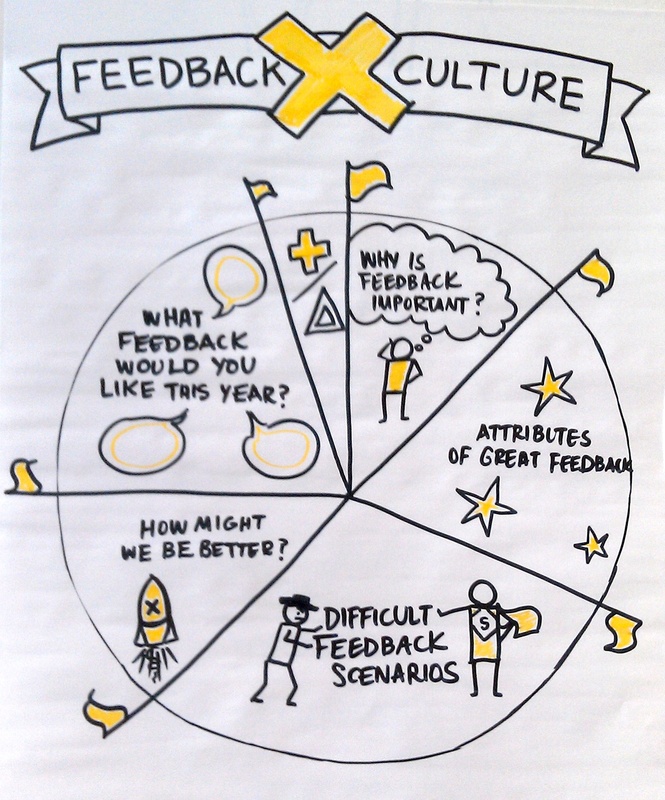 The team at XPLANE gathered on a Friday afternoon to answer this question: “How do we foster a culture of feedback?” As part of XPLANE’s vision and strategy for 2015 (published as a visually stunning XPLANATiON of course), the company made feedback a major component of their culture map. CEO Aric Wood kicked off the session to explain why: “Creating a feedback culture is our fastest path to excellence. It’s what makes us smarter, faster, and improve at an organizational and individual level.” He acknowledged that while XPLANE had already created a strong culture of trust and openness, and has baked feedback into meetings and client projects, there is still significant room to grow and improve. Why use a boring checklist agenda? In their signature visual thinking style, the team spent the better part of the next two hours brainstorming with whiteboards and post-it notes on what it would mean to build a better feedback culture. Led by teammates Stephanie Gioia and Kathryn Jarrell, the team came up with a myriad of use cases for feedback, covering their strengths (project post-mortems, meeting plus/deltas, one-on-ones, and employee surveys) and their opportunities for improvement (design critiques, teammate on-the-spot feedback, strategic management feedback, and ongoing client feedback). And of course, we can’t forget performance reviews, which made their way onto both lists. Next, the question was posed: “What are the common attributes of great feedback?” Some of the most common post-it’s that made it to the wall: respectful, specific, timely, direct, constructive, and actionable. The full list covered upward of 100 post-its, but here are some of my other favorites: with permission, non-defensive, curious, non-judgmental, with empathy, with love, supports failure, private, in your best interest, and as a gift. There was some disagreement though: should feedback be brutally honest or delivered with a light touch? This was a clear case where knowing your audience really mattered. It is also why asking permission, and making sure you are respectful and constructive, is so important. With this list of feedback attributes in mind, we jumped right into skit time! We divided into four groups to tackle challenging feedback topics. Our mandate: act out each feedback topic with a “feedback villain” and a “feedback hero”. My group was chosen to act out giving feedback when you know it will shatter the confidence of the person you are giving it to. As the only outsider, I was selected to be the target of this brutal feedback. My character: a newbie sales person who just bombed his first client sales meeting, and was looking for encouraging feedback so he wouldn’t feel so bad. Act one, “feedback villain”, included a mixture of direct onslaught (“That was horrible, we probably lost the client because of you”) and talking behind my back (“Can you believe that guy?”). Act two, “feedback hero”, was much easier to take. The team gave me honest but supportive feedback on what I did right and how to improve (“You did a great job designing the presentation, but we don’t think the client was very engaged. We’d love for you to spend some time with Tim, he’s been our lead sales person and can probably offer lots of helpful tools.”). This exercise was great, but also showcased an essential truth: it takes practice and patience to get good at delivering (and receiving) feedback. After witnessing four hilarious but admittedly awkward feedback skits, the team members turned inward to share what they personally wanted more feedback on. 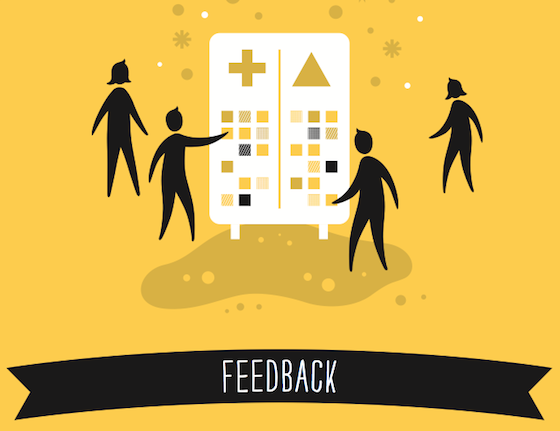 Requesting feedback is definitely a great strategy for making feedback less awkward, but it requires self-awareness and trust (luckily, the XPLANE team has lots of both). As individuals, the team wanted feedback on some of the same issues we all struggle with at work: listening, delegating and saying ‘no’, staying focused, taking things less personally, speaking up, following up, control issues, interrupting less, complaining less, and being present. After the session, all of the personal goals were shared on a public document so the team members could provide welcomed feedback on the challenges they face. As with any good feedback session, we ended with a plus/delta about the meeting itself. What worked: I left the session with a really good picture of the inner workings of a true feedback culture. A feedback culture isn’t some perfect ideal, but a culture that acknowledges both strengths and challenges, and understands that this is why we need feedback in the first place. While XPLANE isn’t perfect, just the fact that they would engage in such an honest conversation about feedback (not to mention, let an outsider come in to write about it) puts them leagues ahead of most companies in my book. And what I’d change: getting better at feedback is a long-term effort, and I wanted to see more solid commitments of how the team was going to make improvements. I trust that they will, and look forward to hearing about their progress.